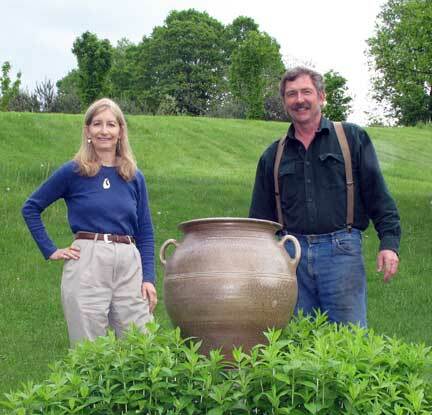 Christine and Robert standing next to large pot. 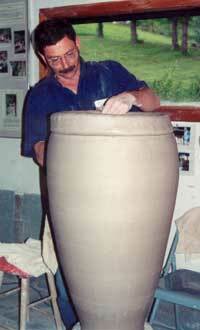 For many potters the goal is to make a large pot. Below you will find the technique Robert currently uses. Coils are rolled on a canvas covered table. Robert has found that coils which are rolled tend be more plastic than extruded coils. With a little practice a six foot coil can be rolled in just a couple of minutes. 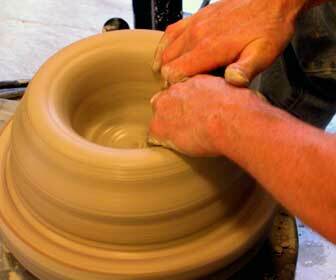 A soft coil is easy to work on to the rim of a pot that has been firmed with a torch. 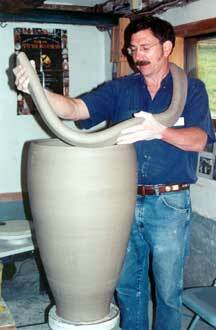 Once the coil is in place, he works to join the coil to the pot. 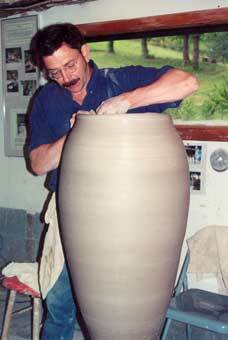 Robert begins by centering a 20 pound piece of wedged clay on the wheel. 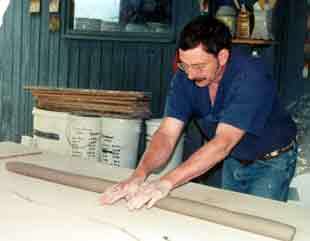 Using as little water as possible, Robert pulls the wall higher and uses ribs to shape the contour. This technique works best when coils are even and soft. The lower section of the pot must be dried sufficiently, to support additional coils. 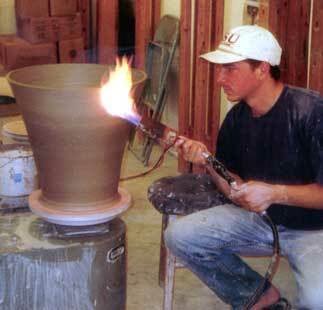 You can see our apprentice, Bryan, using a torch to heat a freshly thrown form. Once the clay stiffens he will add more coils without fear of the walls collapsing. The process is repeated after each coil has been thrown. Once the last section is complete, handles are added and the covered jar is finished. This can all be done in one session using heat to dry the pot, as needed. 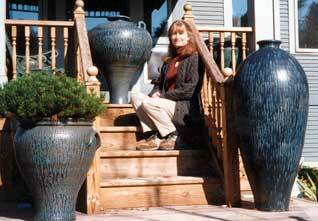 Christine sitting with big pots. 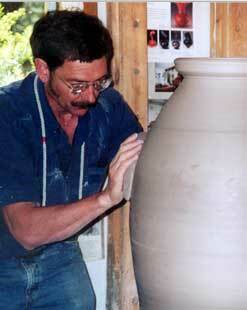 Here are some of the many large pots Robert has made over the years.